Seduced by the glare of royal adoration, Katherine becomes John’s mistress. She will leave behind everything she has stood for to play second fiddle to his young wife and ruthless ambition. She will live in the shadows of the most powerful man in England in the hope of a love greater than propriety. But soon the court whispers – whore, harlot, vile temptress – reach the ears of not just John’s bride but his most dangerous political enemies. As the Plantagenet prince is accused of bringing England to its knees, who better to blame than shameless she-devil Katherine Swynford? I love the deep colour, the beautiful typography, and the image on this cover. The blurb sounds interesting, and even though I don’t read historical novels, I am intrigued to find out more. I had time to click through to the ‘look inside’ option and noticed a handy genealogy map of the Families of de Roet, Swynford and Chaucer. This would be incredibly useful if you weren’t up to speed on your history (me!). I read the first page and liked O’Brien’s style of writing. The novel is written in the first person, which was a gripe for one of the reviewers, but I thought it flowed very well. I started reading this book with some trepidation as Anya Seton’s KATHERINE was the book that started me on a lifelong obsession with historical novels – and I have eventually ended up writing them myself. I didn’t like the over glamorous cover design! 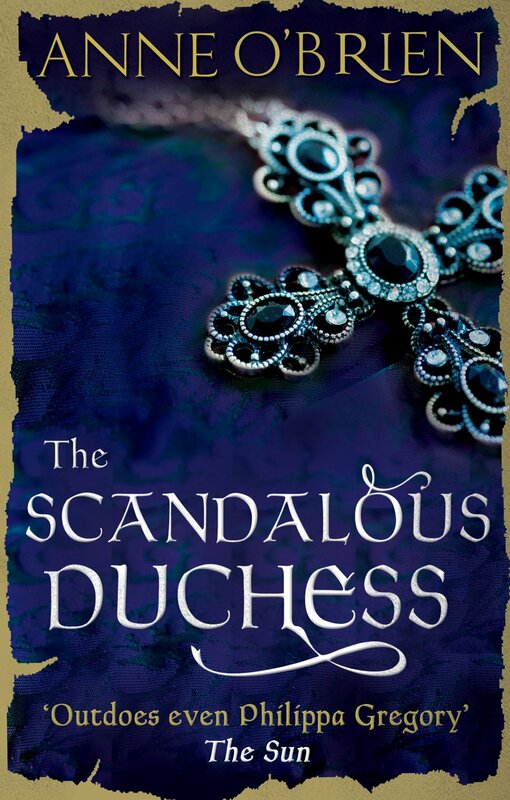 At first I felt uncertain – the book was very easy to read and romantic – starting straight into the Katherine Swynford/John of Gaunt relationship with very little build up, but the more I continued, the more I found that the remarkable historical events seemed to take over. This story cannot follow the classical romance because we know roughly what happened and a lot of it was not romantic at all. I felt that Anne O Brian conveyed the darker moments on Katherine’s life very well and I found myself reading late at night, gripped by the heroines hardships – desperate for things to improve, as I knew they must. All in all I think this novel does add something of value to Katherine’s astonishing story and I feel that the more writers who tackle this interesting period the better. When I finished it I went straight back to read the Anya Seton version again and then on to Alison Weir’s excellent biography of Katherine Swynford. That can’t be a bad reaction! Who is going to write the next version? Judging by the interest that has developed in the Tudor period from the many different versions – this could be the next big thing! I’m hovering over the BUY button just because I love the cover so much, but if I’m brutally honest with myself, I’m not a fan of historical novels. It’s a PASS from me today, but if I ever sway from the dark side (fantasy), I will start here. Next postDo You Judge a Book by its Cover? It’s a very eye catching cover but I have to really be in the mood for a historical novel. The four star review makes me want to reread Anya Seton’s Katherine first but then maybe try this book. Probably. I adored her books when I was 17 or 18. Even my male A level History teacher told me to read My Theodosia. That deep blue/purple is one of my favourite colours, so I’m drawn to the cover like a moth, but 608 pages? I need to sit down! The price is ok to reflect than big a book, but I don’t read a lot in this genre, it’s tempting as you say for the cover alone, I would want in in paperback so I could ogle the cover, A Pass from me today. Totally buy at any price, I’ve been fascinated by the story of John of Gaunt and Katherine Swynford for ages! Retold in a more modern setting in Susan Howatch’s The Wheel of Fortune, if anyone’s interested. ooh lovely 🙂 definitely on my TBR list – thanks!